Primer is vital for readying your walls before you paint them. Find out just how many coats you need before you can paint to guarantee a clean, smooth finish. Look up instructions for almost any paint job, and you’ll consistently see primer mentioned in one of the first steps. Comprised of more resins and less pigment than paint, primer both helps your choice of color adhere better ​and limits the amount that gets absorbed into the surface below. In fact, you’ll actually need ​fewer​ top coats for an even finish when you start with a primer. Generally, one to two coats of primer will suffice for painting interior walls. 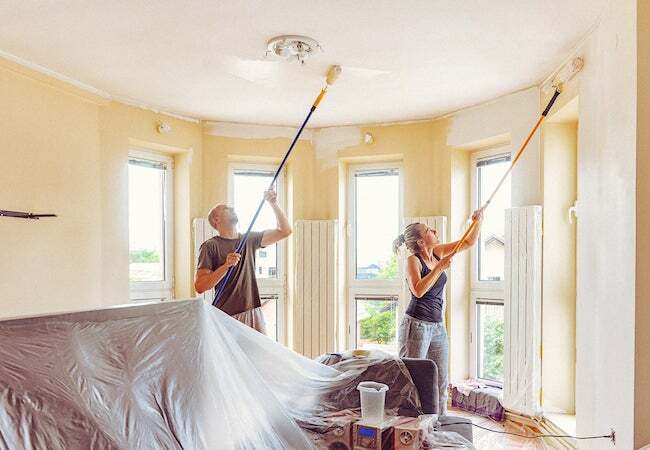 Use one coat of primer if painting any color over a white wall or applying a tinted primer, which helps a dark color evenly go over a light one. Use two coats of primer if painting a very porous surface, such as unfinished drywall, plaster, or wood walls. You’ll also want two coats painting over a dark color with a lighter hue; look for one labeled “high-hide” for best results. The only time you ​can​ skip primer is when using a self-priming paint. These two-in-one paint-and-primer products contain a much higher percentage of solids than average paints, producing a thicker coat.